Understanding how industry-science collaborations work and how the resulting knowledge is used is critical for improving the incorporation of fishers' knowledge in policy-making. We use the concept of 'trading zones' to analyze a collaborative effort to integrate fishers' and scientists' expertise in the Northeast U.S.: the Trawl Survey Advisory Panel. The aim of this collaboration was to improve the production of knowledge for fisheries management by developing a new and improved trawl system (survey net and gear) for the routine data-gathering survey carried out by the federal government. The collaboration was expected to increase the legitimacy and credibility of the science by increasing transparency through a participatory process that made use of fishers' contributory knowledge. We describe how this collaboration shifted among “trading zones,” as well as the role of boundary processes in this transition. Although the government scientists invested heavily in the collaboration, they were ultimately not able keep the process going, as industry members left, sensing that their expertise was not appreciated, boundaries had been erected, and the trading zone for genuine collaboration was closed. A critical area of research in social studies of science explores the extent the public should be involved in technical decisions, or what is referred to as “the problem of extension” (Collins and Evans 2002). Recognizing this challenge, Collins and Evans (2002: 249) call for the development of a ‘normative theory of expertise’ that may guide “who should and who should not be contributing to decision-making in virtue of their expertise.” Critical to this is acknowledging that different kinds of expertise exist and are valuable besides those certified as ‘scientific,’ including, for example, the experience-based rather than research-based knowledge of lay experts (Epstein 1995; Wynne 1992). However, assuming that lay experts should contribute to technical decision-making, questions still remain about how to do this within existing science-based policy-making processes in ways that balance credibility, legitimacy, and salience (Cash et al. 2003). We explore these issues in the realm of marine fisheries management, a site where fisheries practitioners (such as commercial harvesters) often have valuable expertise to provide to science and policy-making, but where law and practice require that the knowledge used in policy-making be certified by science. A large and growing body of scholarship has documented the experience-based knowledge of fishers and advocated its use in fisheries science and management, where science-based knowledge is often scarce and uncertain (Haggan et al. 2007; Holm 2003; Neis and Felt 2001). Fishers are now increasingly involved in the production of knowledge through their participation in what is known as collaborative or cooperative research with scientists, under research protocols that have varying degrees and forms of input from the experience-based knowledge of the fishers, ranging from the mere provision of platforms for research to full cooperation on research questions, design and implementation (Johnson and van Densen 2007; Kaplan and McCay 2004). Understanding how these collaborations work and how the resulting hybrid knowledge is used is critical for improving the incorporation of fishers’ knowledge in science and management. The general problem is that whereas the expertise of fishers can be valuable, even essential at times to fisheries management, fisheries policy, like most natural resource policy, is supposed to be based on science. The ‘mandated’ (Salter 1988) or ‘regulatory’ (Jasanoff 1987) nature of the science policy process often requires clear distinctions or boundaries between what does and does not count as science, i.e., boundary work (Clark et al. 2011; Evans 2005; Gieryn 1983; 1995; Jasanoff 1987). In the United States, federal fisheries policy goes further: it must be based on ‘the best available science’ (NRC 2004). However, fishers are recognized as holding an important form of expertise, what Collins and Evans (2002) refer to as ‘experience-based’ expertise in contrast with the ‘research-based’ expertise of scientists. Fishers have specialized technical expertise, but it is not socially recognized or certified as science. Boundaries are typically drawn such that fishers’ knowledge is positioned as ‘non-science’ due to its localized or anecdotal nature, among other factors (Wilson 2003). This ‘non-science’ status makes it difficult for fishery managers to make direct use of fishers’ expertise since institutional constraints and legal mandates limit decision-making to the best available science, despite the fact that scientists too must and do depend from time to time on localized and anecdotal information (Wilson 2009; Wilson and Degnbol 2002). The successful incorporation of fishers’ knowledge into policy requires that their experience-based expertise be somehow translated into or combined with scientific research-based expertise (Holm 2003). Again, a key question is how to do this in ways that enhance credibility, legitimacy, and salience of the science policy process. The boundary between scientific knowledge and fishers’ knowledge has posed barriers to the use of fishers’ expertise in policy with important implications for the effectiveness of the fisheries management process in the Northeast U.S.; it has directly reduced the legitimacy, credibility, and salience of the science used for decision-making (Ebbin 2004; Johnson 2010). Consequently, at times scientists have been unable to convince managers and stakeholders to follow scientific advice calling for reductions in fishing effort needed to protect depleted fish stocks (Weber 2002). Recognizing this problem and its implications for ‘linking knowledge to action’ (Cash et al. 2003), significant resources in the Northeast region have been directed towards knowledge exchange and communication between fishers and scientists, including significant investment in cooperative research ventures involving both fishers and scientists (Hartley and Robertson 2006; Johnson 2010; Johnson and van Densen 2007; Kaplan and McCay 2004). Such collaboration creates a process more likely to produce salient information because it engages end-users early in defining data needs. It can increase credibility by bringing multiple types of expertise to the table, and it can enhance legitimacy by providing multiple stakeholders with more, and more transparent, access to the information production process. In cooperative research there is exchange across the social boundary between scientists and fishers, as well as their different domains of expertise (Johnson 2011). These and other industry-science engagements (Jenkins 2010) can be analyzed in relation to understanding of boundary objects and boundary work. The underling need or problem inspiring a particular cooperative research project, such as unintended ‘bycatch’ or stock depletion, can function as a boundary object, as can the methods, protocols, and instruments of the research effort, such as fish tags, at sea surveys, or specialized fishing nets. As an example, Jenkins (2010) identifies how a specific gear technology, a turtle excluder device (TED), that was developed in partnership with fishers and scientists became a boundary object. Indeed, gear technology is a key site for cooperative research in fisheries because of the fact that fishers often have greater expertise in this regard than do scientists and the technicians who work on surveys (McCay et al. 2006). Boundary work (Gieryn 1983) in cooperative fisheries research is represented by events that reaffirm or maintain the boundary between fishers and scientists, such as those that limit or discourage communication or where scientists claim the authority to determine what does or does not count as valid information (Johnson 2010). Critical to success of many cooperative research projects are “boundary spanners,” or those with interactional expertise necessary to communicate on both sides of the boundary between science and industry expertise (Johnson 2010; 2011). Collins and Evans (2002: 254) define interactional expertise as “enough expertise to interact interestingly with participants.” While this may include a shared language, we also interpret interactional expertise to be enough understanding of the other’s world (e.g., their culture, values, experience, etc.) to be able to have conversations and collaborate with others across the boundary. This allows for the exchange of expertise or knowledge across a science/non-science boundary, including the possibility that non-scientists take on roles scientists typically perform, such as forming hypotheses, writing proposals, and peer review (Johnson 2010). Boundary spanning does not happen easily or automatically. The value of cooperative research for decision-making depends on how well these institutions work. Managing the boundary in a way that balances legitimacy, credibility, and salience can be quite difficult (Cash et al. 2003; Clark et al. 2011). This is especially true in participatory processes involving scientists and non-scientists (Wilson 2009). As an example, in an assessment of a cooperative research effort involving Illex squid, Johnson (2011) illustrates how distrust can quickly erode progress made at managing the boundary between fishers and government scientists, with lasting negative effects on the legitimacy and credibility of the process. This study provides an in-depth analysis of a similar situation, where progress in managing the boundary between fishers and scientists to improve the state of knowledge for fisheries management is achieved but also threatened and finally eroded. In order to better understand the process of integrating the experience-based expertise of fishers into the science used for fisheries management, we draw on the framework of “trading zones” presented by Gorman (2002) and Collins et al. (2007) to analyze variation and change in the nature of interactions between different kinds of experts. Building upon the work of Collins and Evans (2002) and Galison (1997), Gorman (2002) first linked expertise to trading zones, a metaphor based on ethnographic studies of encounters where interdisciplinary exchange took place to produce new, shared understandings between linguistically and culturally distinct groups. The framework was modified by Collins et al. 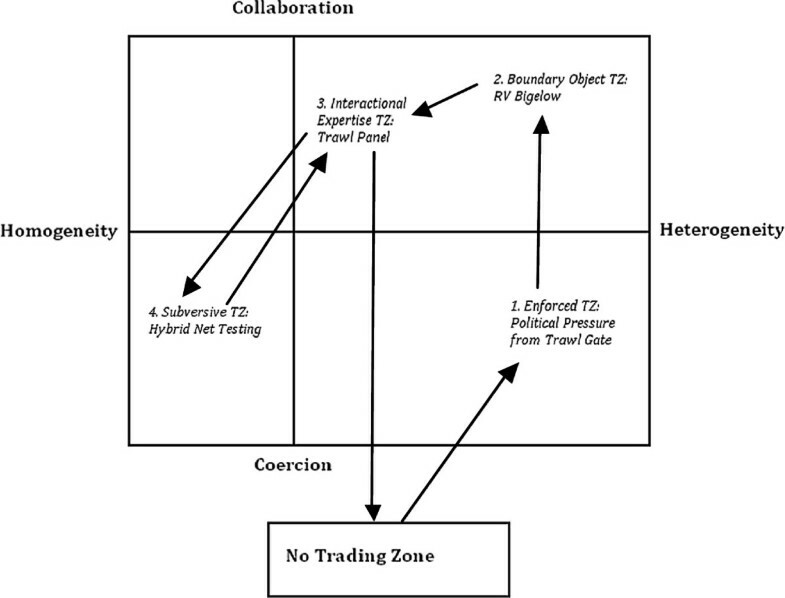 (2007) to reflect two key dimensions of trading zones: heterogeneity/homogeneity and collaboration/coercion, creating four idealized trading zones. Inter-language trading zones are characterized as having collaboration and homogeneity that emerge through the creation of ‘in-between’ vocabularies. Subversive trading zones sit at the opposite end of the collaboration spectrum and are highly homogenous and coercive; here the dominant party has overwhelmed the other such that it is no longer recognized as valid. On the other hand, enforced trading zones occur where heterogeneity remains among the parties; in this situation exchange occurs, but it is forced at least on one side. It can be forced, for example, through “institutional power,” (Collins et al. 2007; Jenkins 2010) similar to boundary work described above where one group claims authority to determine what counts as science and non-science. The enforced trading zone can also come about when one group is encouraged or pressured to collaborate with another group (Collins et al. 2007; Jenkins 2010). Finally, fractionated trading zones are highly collaborative and heterogeneous. There are two sub-categories of these latter zones: boundary object and interactional expertise trading zones. Boundary object trading zones rely on boundary objects to mediate between groups, while interactional expertise trading zones instead are mediated by a linguistic exchange (Collins et al. 2007). The latter would also include exchange possible from sufficient understanding across groups (e.g., of others’ culture, values, interests, experience, etc.) that allows for conversations and collaborations across the boundary. Jenkins (2007; 2010) applied the trading zone framework to analyze relationships between the National Marine Fisheries Service (NMFS) and the shrimp fishing industry in the creation, evolution and adoption of a device for preventing nets from catching turtles. Based on her application of the trading zone framework to her specific case, she hypothesized that changes along the level of homogeneity/heterogeneity are due to variations in the degree of shared language; she suggests that as the “ability to communicate increases, the flow of information that can result in changes in another culture will also increase, thus altering the degree of heterogeneity” (Jenkins 2010: 83). With this in mind, she switched the axis and replaced the homogeneity-heterogeneity axis with a shared language axis, beginning with a “no shared language.” She also identified space where trading zones would not likely emerge, where conditions are “unfavorable.” Finally, she called for more case studies to be applied to the trading zone framework. We offer such a case. We apply the modified trading zones framework to the task of understanding the emergence and ultimate demise of a collaborative effort to integrate fishers’ and scientists’ expertise in the Northeast U.S.: the Trawl Survey Advisory Panel (Figure 1, Table 1). The aim of the panel was to provide advice to the government on designing a new and improved trawl system (survey net and gear) for the routine data-gathering survey carried out by the federal government’s Northeast Fisheries Science Center (hereafter Science Center). The government bottom trawl survey provides invaluable information for the stock assessments that form the basis for fisheries management. The advisory panel, made up of fishing industry members, government and academic scientists, was intended to use fishers’ expertise to help government scientists and engineers design the new trawl system. Moreover, the collaboration was expected to increase the legitimacy and credibility of scientific findings that depended on the survey, which were poor and worsened by an event to be discussed below. In theory, a participatory process that made use of fishers’ expertise should improve the transparency of the trawl survey and increase the credibility of its results, as fishers are widely thought—by other fishers—to have the technical expertise required for proper trawling, i.e., catching fish with a net. We illustrate how this collaboration shifted from a period of boundary work (no trading zone) to an enforced trading zone, and then a fractionated trading zone, characterized by both boundary object and interactional expertise trading zones (Table 1; Figure 1). We also assess what contributed to the fragility of “trading” and the ultimate demise of the collaboration. Evolution of the Trawl Survey Advisory Panel. The analysis is based on ethnographic research conducted in the Northeast U.S. between May 2003 and November 2006, with follow-up research conducted in December 2007 to July 2008. Data collection primarily consisted of informal and formal interviews, direct observation of public meetings, and a review of relevant documents. The research was part of a broader study of the role of fishers’ experience-based knowledge in the science policy process. This case study reflects not only observations of the process but also the experience and observations of Panel members. This case study draws on 18 semi-structured interviews conducted with a purposive sample that included over half of the Trawl Survey Advisory Panel members as well as with other industry, management, and science stakeholders. Formal interviews ranged from one to four hours in duration. In addition, observations and informal interviews and conversations occurred at thirteen of the fifteen Panel meetings held from May 2003 to February 2008. We also observed formal, public presentations from the Panel at industry forums and management meetings. Documents analyzed included media reports, public documents and correspondence, technical reports, and transcripts of Panel and fishery management council meetings. We used the qualitative analysis software QSR N6 to analyze transcribed interviews, notes from observations, and other documents. The next section depicts the period prior to creation of the Panel (1963–2002) and preliminary efforts to bring science and industry together over the issue of the fisheries survey. We then focus on the activities of the Trawl Survey Advisory Panel, which we studied intensively from May 2003 to February 2008, when the collaboration officially ended. We use the notion of trading zones to analyze stages in the process of science/industry communication and collaboration. We document changes in the nature of trading zones over time and industry perception of transparency and hence, to a large extent, legitimacy of the process (Figure 1 and Table 1). We begin by presenting the events leading to the Panel’s formation that provide context necessary for understanding the collaboration. In the fisheries science policy process, one barrier to industry participation and sharing expertise is reliance on large-scale, quantitative stock assessment models as the basis for decision-making. Degnbol (2003) describes the development of fisheries science over the last 100 years with its focus on the ‘stock concept’ as widening the gap between fishers’ knowledge and the knowledge used in science, and between fishers and management. After World War II, the fisheries management paradigm of maximum sustainable yield took hold (Larkin 1978). The idea was to determine the maximum catch that could be harvested continuously over time. This necessitated a fisheries science that aimed at collecting detailed statistics of fish populations and developing models for prediction and assessment of changes in fish population dynamics. To avoid statistical problems associated with using data collected from fishers, scientists view fishery-independent data as an unbiased indicator of changes in relative abundance over time. Systematic resource surveys using standardized sampling gear (e.g., commercial-style otter trawls) were developed in the 1960s to collect fishery-independent data needed for stock assessment (Sissenwine et al. 1983). In the northeastern U.S., the federal government oversees the collection of the most important source of fishery-independent data, a bottom trawl survey. It has sampled from the Gulf of Maine to Cape Hatteras consistently for more than 40 years, making it one of the longest running fisheries survey time series in the world (Azarovitz 1981; Sissenwine et al. 1983). The geographic scope of the survey covers both the New England and Mid-Atlantic fishery management regions, a total of 268,000 km2. Yet the needs of fisheries management have shifted since the survey first began in 1963. For example, managers now use the survey data as the basis of management advice for more species than was originally intended, including some imperfectly sampled by bottom trawl technology. Fisheries science policy is also shifting towards ecosystem-based management and adopting area-based strategies, such as spatial closures and gear restricted areas (Browman and Stergiou 2004; NMFS 1998) and quantitatively-specified catch limits. One government official noted that “demand for both data and precision in recent years had outstripped the original design of the survey” and recommended “new gear and survey designs to give us the tools to understand the ecosystem” (NEFSC 2002b: 26). Despite these needs, significant changes in survey gear, operation, or design tend to diminish the value of the survey or require costly calibration experiments to make results comparable (Gunderson 1993), given the premium placed on a long and comparable time series. The government’s bottom trawl survey has long sparked disagreement between fishers and scientists. Overall, the most significant criticism of the survey offered in interviews relates to the survey gear and its deployment. Fishers argue that the survey has long used the wrong fishing gear and towed that gear at the wrong speed, reducing performance in ways that likely led to an underestimate of fish abundance. The gear used on the research vessel, the R/V Albatross, was outdated compared to the gear currently used by the fishing industry. In addition, the same net and footgear were used throughout the range of the survey, which fishers view as inappropriate given the different bottom types and species found in New England and Mid-Atlantic waters. Additionally, according to expert fishers and gear scientists interviewed, the net did not open high enough to sample some of the more pelagic species, those that reside in the water column away from the bottom (e.g., scup and squid), and the roller gear causes the net to “jump over” bottom fish (e.g., flatfish and monkfish). I was running the boat out here, and the [government’s vessel] was alongside of me, and I had a boat with 165 horsepower and I towed a Yankee 35 net, and I was towing 2 hours and getting 30 baskets of yellowtail. [My] boat was only 56-feet long, the [government’s vessel] was probably about close to 200 feet long…probably had 1,000 horse power in it, and he was towing the same [Yankee] 35 net I was. The guy tells me, he says ‘Captain, there’s no fish around here.’ I says, ‘What do you mean?’ He says, ‘Well, we only have 3 baskets.’ I was catching 30 baskets. Another ‘side-by-side’ fishing experience took place when the commercial fishing vessel Jason and Danielle towed alongside the R/V Albatross IV in a cooperative effort in 2001. The industry members involved in that program, which had been jointly designed by the government, university scientists, and the industry, observed that the research vessel was not catching the same amount of fish as the commercial vessel was. In the spirit of cooperation they provided some recommendations to the government officials to improve the survey. Following this, and media coverage depicting the industry members’ concerns, the government abruptly ended the cooperative venture (NFI-SMC 2002). This was an early experience of the kind of “boundary work” that would later affect the Trawl Survey Advisory Panel, and it may be telling to the outcome of the Panel that many of its members had also been involved in this earlier cooperative venture, and were thus aware of the potential for government scientists to reinstate boundaries that cut short collaboration. … everyone challenged them, but nobody had any substantial challenges for them. Until Humpty-Dumpty fell off the wall, and he went into so many pieces. A key event provided the impetus for alterations to the government’s bottom trawl survey and created a space for collaboration where the expertise of both fishers and scientists were brought together to address a significant problem. Political pressure for change arose in September 2002 when the government announced the miscalibration of the gear used on the government’s trawl survey (Malakoff 2002; NEFSC 2002b). The trawl warps connecting the doors to the net had been mismeasured (Figure 2). Doors are critical components of the trawl system that hold the net open underwater; uneven warps connecting the doors to the net affect the opening of the net and therefore the ability of the net to catch fish. A local fisher first noticed that the warps were mismeasured and reported it to the Science Center, but the Center did not confirm the error until two years later (Cook and Daley 2003). This error, and the delay in confirming it, led to use of the term ‘trawl gate’ by fishers and media, a politically charged reference to the ‘Watergate’ episode of illegal actions and failed cover-up that took down the Nixon presidency in the U.S. Building on many years of concern about the trawl survey, skepticism quickly emerged regarding the validity of stock assessments and management advice based on survey data (Plante 2002b). Fishers interviewed said that a reason the observations about the warps were dismissed was because those observations did not come from scientists and were, therefore, not considered valid, reflecting their awareness of boundary work. Illustration of bottom trawl gear used in the survey. Modified from North Pacific Research Board (2012). [T]he best way to change this net would be unhook the shackles that connect the wings to the bridles, remove the tripper rope, and replace the whole net with a newer design net that is more adept at doing the job the trawl survey requires of it. The old net could then be retired to an antique fishing museum where it belongs, and the doors should go with it. Because of the revelations about an error in the survey gear and long delay in responding to information about it, colored by widespread use of the term ‘trawl-gate,’ the government scientists were politically obliged to change their practices and open up a dialogue with the fishing industry (and the public) about the survey. Political pressure came from members of the U.S. Congress. Moreover, it was no longer possible to make the argument that survey consistency and standardization required no input from fishers, because it was possible that the survey was not being done consistently. The trawl error threatened the government scientists’ authority to maintain the boundary between science and non-science with regard to the survey. Thus, for a short period of time, roughly 3 months, an enforced trading zone emerged. Scientists were politically obligated to open up the ‘black box’ of the trawl survey to non-scientists. The [Science Center] agrees that the current survey design and time series provides useful information for science and management interests, and will not immediately alter the currently employed methodology without careful consideration. However, the [Science Center]…is committed to implementing a strategic process to refine and develop new survey systems…A strategic design process will be implemented that includes involvement of fisheries scientists, managers, and a diverse group of stakeholders (Boreman 2003). It is not clear whether the ‘strategic design process’ envisioned by the Science Center above called for genuine collaboration in designing a new trawl net or simply some degree of stakeholder participation, itself an advance over the previous forty years with little if any industry participation. Indeed, ambiguity about or conflicting interpretations of the role of non-scientist stakeholders likely played a role in the eventual outcome. However, it is clear that during the period immediately after ‘trawl gate’ forced scientists to listen to industry, both groups were for the first time communicating about the survey, expressing their expertise related to the problem, and more importantly, beginning to listen to each other. With ‘trawl gate,’ the survey could no longer be back boxed. The survey now represented an issue to which both groups had expertise to contribute and an interest in being involved (although their interests differed), and both groups recognized the necessity of the other group’s contribution. The survey was more than just something that brought different kinds of experts together; it was a problem that required the expertise of both fishers and scientists. Both groups had an interest in improving the survey and expertise to contribute. In terms used by Collins et al. (2007), they were exchanging within a fractionated, boundary object trading zone. The participants would maintain their identities: industry members were just that, and scientists remained scientists. In this zone, the group remained heterogeneous or fractionated, but exchange was occurring focused on improving the trawl survey. A new boundary object had emerged following ‘trawl gate’ that called for continued collaboration, namely the task of designing a new trawl survey net to be used with a new, state of the art scientific research vessel. At 208.6-feet, the R/V Henry B. Bigelow is much larger and more powerful than the vessel it replaced, the 187-foot R/V Albatross IV. The impending arrival of the new vessel created a pragmatic need for new survey gear. To paraphrase one fisher, “why put fifty year old gear on a 21st century vessel?” The need to update the survey net was a welcomed opportunity for some scientists as well; as one government scientist explained, “We don't get to revise our technology very often” (Griffin 2005). In response, the Science Center appointed an advisory panel to provide advice regarding the government’s bottom trawl survey. This shifted the collaboration into one also characterized as a fractionated, interactional expertise trading zone. By interactional expertise we mean “enough expertise to interact interestingly with participants” (Collins and Evans 2002: 254). While this may include a shared language, we also consider individuals with this type of expertise to include those simply having enough understanding of the other’s world (e.g., their culture, values, experience, etc.) that allows them to have conversations and collaborate with others on the other side of the boundary. The Trawl Survey Advisory Panel (hereafter Panel) was composed of fishery management council members, fishers, and expert gear and survey scientists from the New England and Mid-Atlantic regions (Table 2). Charged with providing advice to the government regarding its trawl survey, the Panel met fifteen times from May 2003 to February 2008. Because the expected delivery of the new vessel was in the Spring 2006, the Panel operated under strict time constraints. More specifically, the Panel consisted of two fishery management council members and two industry representatives from each region, plus five scientists from academic institutions and two federal fisheries scientists from the Science Center (Table 2). Fishery management council members are citizens appointed by the government to serve on regional management councils; they generally represent commercial or recreational fishing interests but also may include environmental or consumer interests. In this case, three of the four council members were commercial fishermen with expertise related to fishing gear. A Mid-Atlantic Fishery Management Council (MAFMC) representative chaired the panel, while the vice-chair was a New England Fishery Management Council (NEFMC) representative, and both were fishers. The fishers and scientists selected as members of the Trawl Survey Advisory Panel were involved in cooperative research, fisheries management, or applied fisheries science, and they were most likely selected to be on the Panel because of this expertise at collaboration as well as their technical expertise (Table 2). This fact contributed to the rapid emergence of a group of people who understood the complex, technical and scientific problems being addressed and also had the experience, knowledge, and skills with which to communicate. In other words, these individuals possessed interactional expertise (Collins and Evans 2007) with which they were able to communicate on both sides of the boundary. Through engagement in cooperative research, fishers and scientists learn enough about each other's world so that they can have the necessary conversations to make collaborations work (Johnson 2010). The Panel scientists were not experts at fishing, but knew enough about fishing gear and vessels to talk with the fishers. The fishers could participate in technical stock assessment meetings, make contributions to the discussion, and even offer input based on their expertise, but they did not have the technical expertise to do the actual assessments. In other words, while the fishers had contributory expertise, or what is needed to contribute to an activity (Collins and Evans 2007: 14), related to fishing and gear design and use, they also had interactional expertise related to stock assessment/science. Moreover, because of their experience with cooperative research ventures, they understood the basic objectives and needs of scientific efforts, which helped their contributions be relevant. With their interactional expertise they had enough understanding to allow conversations and collaboration with others on the other side of the boundary. Individuals with interactional expertise do not have to have contributory expertise in both fields, but need to have enough understanding of both sides that they can talk and cooperate with others. The principal challenge of the Panel was to design a new trawl system for the new research vessel, the R/V Henry B. Bigelow, one that would fish consistently and achieve a more representative catch compared to the old survey net used on the R/V Albatross IV. In order to collect and process an adequate amount of biological data from each tow (e.g., measure and weigh fish), while still being able to complete all tows in the survey in its allotted time, it was also critical that the survey net not catch too many fish. The fact that the fish are considered a public resource, and many fish stocks were in depleted conditions, furthered the objective of catching as few fish as possible while still collecting a sufficient amount of scientific data. Catching less than the maximum amount of fish possible is not the typical objective of fishers when operating fishing gear, but the fishers on the panel accepted and embraced the challenges inherent in this objective. The Panel agreed upon several other items at the outset that guided their deliberations. The Panel agreed on the performance characteristics of a trawl system to be used in the trawl survey. These characteristics, such as how high the net should open in the water column when towing to ensure capturing pelagic species, were used to determine if the net designed was acceptable. The Panel also decided that industry gear manufacturers would be important in designing a trawl system because they were viewed as having the necessary expertise and skills, and, most importantly, were trusted by the fishing industry. Given the heightened level of concern about the legitimacy of the survey, this trust was necessary for producing industry confidence in the survey. After deliberation with the Panel, three trawl gear manufacturers came together to propose several designs for the Panel. The Panel endorsed a 4-seam, 3-bridle net (later named the Bigelow net) for consideration and testing. The work of the gear manufacturers, who were otherwise industry competitors, was often pointed out to us as an indicator of the highly collaborative spirit that characterized the Panel during this period. The proposed new trawl system included the Bigelow net, sweeps (bottom gear) and doors necessary to improve the performance of the survey (Figure 2). According to one trawl gear manufacturer involved in the design of the net, the intent was to design “something that everyone has seen or wouldn’t have too much opposition to.” Compared to the old net, the new trawl would have the “ability to open up fully and has the ability to spread out more, and maintain its contacts with the sea floor.” Two different types of sweeps were identified for potential use in the survey to better sample the different habitat types found throughout the region. The Panel further selected a preliminary set of doors for testing (Thyboron 66" doors). Again, the doors are critical components of the trawl system because they hold the net open underwater (Figure 2). The Panel was uncertain about the correct size of the doors that would be necessary for optimal performance and consistency on a vessel the size of the R/V Henry B Bigelow. The Panel contributed significantly to the interpretation of the gear testing data collected during field cruises. After each cruise, government scientists reported results to the Panel, and the Panel members worked together to generate recommendations and hypotheses for further testing. The most critical issue that persisted throughout the development of the new net was “overspreading” of the net, which meant the net would not be fishing properly. To address the problem, the Panel recommended that several different door types and/or door sizes be tested to try to achieve optimal spreading of the net. As discussed later, the final decision to select the doors for the survey was central to the closure of the trading zone, the end of effective collaboration. The above highly collaborative process was threatened prior to formal adoption of the proposed net, when Science Center scientists decided to test a different net without the input or consent of the Panel. Throughout the process, the government scientists had expressed their concerns regarding the adjustability and complexity of the Bigelow net proposed by the Panel. It is important to ensure that the survey’s trawl net is always fished the same way to ensure standardization and comparability of the data over time, and government scientists had concerns about this. One concern was that the net would have to be continuously adjusted to fish consistently, a common practice among fishers. Another was that the net might be too difficult for scientists to repair given its complexity, reinforcing industry’s concern, in turn, that government scientists and crew on the survey lacked the expertise to make repairs and deal with the complexity of more modern fishing gear. To address these concerns, the Science Center decided to test a different version of the Panel’s net in February 2006, one that the Panel had no involvement in developing. This was considered a ‘hybrid’ of the Panel’s recommendation. As important were procedural concerns that threatened to negate the entire collaborative process. One was the issue that the gear manufacturers who designed the proposed Bigelow net for the Panel were not consulted in this decision. One fisher referred to this as evidence that the decision was “cavalier” and therefore “offensive.” In addition, several Panel members objected to the process, dismayed that the decision had come outside of the Panel. In other words, they challenged what seemed a loss of the transparency of the process. In this situation, to fishers at least, the collaboration was more like the enforced trading zone as Collins et al. (2007: 659) described, where “the elite group will make little or no attempt to gain access to the expertise of the natives.” However, this is a very different situation than the previous enforced trading zone where scientists were forced to collaboration with fishers due to political pressure. Therefore, we view this moment as more like a subversive trading zone, characterized with little collaboration and homogeneity, because the process was dominated by the scientists’ views and culture. The Science Center scientists, for their part, felt that they had acted legitimately and transparently, having approached the Panel with this proposal before proceeding. But industry members were skeptical, since the decision itself was made without them, and this appeared to be a signal that the government was abandoning its intention to take seriously industry’s expertise and concerns regarding the survey. It was considered a dismissal of their knowledge and expertise. To them, ignoring the advice and expertise of the industry members undermined the spirit and intent of the collaboration. At the heart of the issue was the industry members’ sense that their advice was no longer contributing to decisions. It was obvious from the December 2005 meeting that a high level of skepticism and distrust still remained after three years of collaboration, and the distrust resurfaced when the government scientists appeared to make decisions outside of the advisory process and then dismissed the advice of the Panel. At this time, the collaboration level was low; fishers felt their contribution to the effort was threatened and the trading zone was more “subversive” than collaborative. Fishers still wanted to be involved, and despite being offended by the Science Center’s proposal, the trading zone did not close entirely. During the December 2005 meeting, some industry Panel members said that the government scientists should “go ahead and test the net,” confident that testing would show that the hybrid net would not work. Testing in February 2006 indicated that the fishers were right, and the hybrid net design was abandoned by the Science Center. From the industry members’ perspective, the outcome confirmed their predictions and reaffirmed their expertise. At the March 2006 Panel meeting, the dispute was settled quickly, within an hour or so. At this meeting Panel members and the public were given an opportunity to communicate their views, and the Science Center representative listened and responded in a calm and respectful manner. The Science Center representative expressed his concern that they “can only try things that come through the Panel” and believed they had “acted upon every recommendation that [had] been suggested by the Panel,” suggesting a view of the Panel as advisory to the Science Center. By allowing everyone to communicate honestly and openly, the issues at the core of the conflict were addressed. The meeting minutes expressed “broad consensus that better communication could significantly alleviate future concerns.” The Panel shifted its attention back to the Bigelow net, and the collaborative trading zone opened again. It lasted for another year and a half. At this stage, the collaboration was viewed as a significant success by observers and most participants (Plante 2007). Both regional fishery management councils and the Science Center formally adopted the recommendations of the Panel in December 2006 and February 2007. The Panel Chair said that it had been “a privilege to chair this group” and was “proud to be part of it.” Another Panel member publically stated, “Industry feels very comfortable with this net” (Plante 2007). Fishers and gear experts expressed confidence in the net and the Panel was praised for its accomplishments (Plante 2007). With the council’s adoption of these recommendations, the Panel had merged two forms of expertise and the resulting product was viewed as more credible and legitimate for management and science than was the previous trawl system. The Trawl Survey Advisory Panel served as a site for collaboration among fishers, scientists, managers, and, to some extent, gear manufacturers. It was an interactional expertise trading zone. The survey continued to represent a boundary object, and the shared problem had become the testing and fine-tuning of the Bigelow net for the survey. The fishers and scientists involved brought to the effort the interactional expertise developed from previous involvement in cooperative research and science-based fisheries management, as well as “contributory” expertise from their respective fields. Both industry and scientific expertise were essential throughout this collaborative phase. Unlike the situation prior to the creation of the Panel, when the trawl net served as a boundary object within a highly politicized context, this phase of the collaboration drew on fishing industry expertise to jointly develop hypotheses (i.e., gear configurations) for testing, through the process of boundary spanning, and then tests of those hypotheses. However, the Panel’s work was not done as they still had to identify the doors to use with the Bigelow net, and remnants of distrust remained. There was considerable optimism about the collaborative process and its ability to generate a satisfactory outcome, reinforced by joint testing of the proposed new net in the summer of 2007 on the new research vessel. Both regional fishery management councils formally adopted the recommended Bigelow net upon recommendation of the Panel. The Science Center began testing the proposed net on the R/V Henry Bigelow, in the summer of 2007. The Panel chair and vice-chair were on-board to observe and provide their expertise. They worked closely with Science Center scientists and technicians to make necessary adjustments, mainly with the doors that are used to spread open the mouth of the net. Although the recommended doors (Thyboron 66”) had worked well on the industry vessel used in an industry-based survey, they discovered that the doors did not work well on the new vessel especially in deeper waters. They tried a variety of different door sizes and eventually tried a different type of door, the Patriot door, which achieved the desired results. At that point, according to the chair on August 2007, “the Science Center…has got a package that they can start the calibrations with, and no one is happier than I am.” Moreover, he stated, “it all went very well and I was glad to be able to help the Science Center and help our industries with better science in the future” (MAFMC August 2007: 192). However, just two months later, in October 2007, the trading zone began to close due to another alleged failure of communication and transparency. The Panel chair reported at a fishery management council meeting that the Science Center had made significant changes to the gear without communicating with the Panel. He explained that the government scientists had told the manufacturer to add 200 pounds to the door. In his mind, this drastically altered the performance capability of the gear. He said that the government scientists are “not experts when it comes to gear, and they better…reach out to someone that knows what…they are doing. And they haven’t done that.” He explained his frustration about the process: “We have got some major, major communication problems and a mistrust to a level that…There is zero communication between the Science Center and the Trawl Committee.” He went further, questioning the agenda of the Science Center by asking for “some indication from the Science Center that they weren’t just stringing [them] along to cover…the trawl warp issue,” a reference to the incident that had initiated the process leading to the Panel. The Science Center scientists subsequently met with the Panel chair and in November responded formally in a letter, arguing that they had in fact worked with the Panel chair and vice-chair and had written them about their choices of new doors. They also gave their rationale for making other changes in the gear, including differences in interpretation of some key data. They concluded with praise for the Panel: “During the last 4.5 years, the TSAP (Trawl Panel) has facilitated an effective interaction between the NEFSC and its stakeholders which has resulted in considerable progress relative to fishery independent trawl surveys.” The letter concluded with reaffirmation of their desire for the collaboration to continue. The Panel met again on February 21, 2008. The only industry representatives present were those who were there in their capacities as fishery management council members. Although perhaps not fully obvious at the time, the trading zone was closing: other industry members were absent in protest. At that meeting and in subsequent weeks the issue of the trawl survey doors was discussed by the few Panel members in attendance and Science Center staff, further testing was done, and the door manufacturer provided considerable help. The decision was made by the Science Center to use doors that were never discussed by the Trawl Committee…They were ordered without any consultation…The approval was made in the Science Center. And I understand that we are an advisory panel, but if we’re going to have a working relationship, it can’t be all their side. The principal problem from the perspective of the fishing industry Panel members, who expected to be kept informed and consulted, was that in this instance they were not. The Center’s decisions appeared to lack the Panel’s input and disregard their recommendations about the doors to use on the trawl gear as well as other matters that were regarded as important by members of the Panel. For example, the Panel had recommended that the trawl survey use two sweeps of the bottom gear rather than one, to accommodate differences they knew between New England and Mid-Atlantic conditions, but the Science Panel opted for one. Ambiguity and differences in interpretation of what an “advisory” panel could and should be contributed to the problem. As the quotation above indicates, industry members accepted that the panel was “advisory,” and therefore lacked decision-making authority, but participants expected “a working relationship” among scientists, fishers, and others that implied full transparency and some joint decision-making as well. The lack of transparency and the decision-making autonomy of the Science Center gave rise to further expressions of distrust. For example, some Panel members suspected that the decision to test a different net without consulting the Panel was due to pressure from other stakeholders, operating outside the process. The Science Center members defended their actions as due to technical concerns about complexity that had not yet been addressed by the Panel, as well as the need to act quickly, as time was running out to make a decision on the net before the new R/V Bigelow arrived. [I]n all fairness, this might be the perfect door for that boat and that net, but here is where my problem is; not one piece of evidence, not one documentation, not anything to determine what the configuration of that net being used for this 300 tows for the calibration is….There was some data that was provided for that decision to be made. It has not at all been shared with me or the committee or anyone that I know of. I agreed to participate on the panel and work with NMFS because I was convinced that working together we would design a survey system which would have not only the confidence but would be beneficial to all involved…[T]he government science center] has decided to use only part of the panel’s recommendation…Using only part of the panel’s recommendation is insufficient to provide the credible, repeatable, accurate surveys necessary. [letter of April 15, 2008, from an industry representative on the Panel, writing on behalf of the other fishers on the Panel]. Using the language of ‘credible, repeatable, and accurate’ is further indication of the extent to which industry participants wanted to represent themselves as full colleagues of the agency scientists. They claimed to share acceptance of scientific criteria for truth-seeking, and therefore claimed full justification for anger about not having been consulted on all matters. [The Panel] was formed to try to utilize – to create a cooperative effort on the part of the industry and the Science Center to rectify the problems that came out of what is now considered trawl gate. In the first few years…the working relationship was excellent. I really felt like it was going to be the answer to a lot of our questions and concerns…[T]he role of the industry here was going in, in a cooperative frame of mind and manner, to work … hand in hand with the Science Center…But in the past year…there has been a complete breakdown of communication between the Science Center and the industry…I’ve been holding the guys together with…my word, and they have all abandoned ship here…I reluctantly have to resign my chairmanship of that committee, effective immediately. The complex trajectory of the Trawl Survey Advisory Panel provides important lessons for improving the effectiveness of industry-science collaboration and the place of non-scientific experts in science. Key industry members of the Panel brought both interactional and contributory expertise to the task they shared with scientists. Their prior experience through cooperative research gave them interactional expertise, that is, the ability to communicate with scientists throughout the collaboration. Those skills allowed an interactional expertise trading zone to emerge around the boundary object of the survey trawl. Fishers brought technical knowledge about gear deployment, gear design and vessel operations, as well as ecological and environmental knowledge related to how different gear configurations interact with specific species or species assemblages in different environments. The value of fishers’ contributory expertise in this regard is widely recognized in industry-science collaborations (Glass and Manning 2007; McCay et al. 2006). Scientists contributed knowledge and expertise related to experimental design, biological sampling, stock assessment, and data analysis. And, like the fishers, they also held interactional expertise from working with fishermen in cooperative research. However, as we have seen, the interactional expertise held by members of the Panel was not sufficient for the trading zone to persist. The opportunity for genuine ‘buy-in,’ a frequently sought result of industry-science collaborations, was diminished by difficulties in communication and limits to transparency. We have cast the collapse of this effort in analytic terms as the closing of a trading zone. The Panel worked well when there was two-way communication between the scientists and the industry partners. When it appeared that the dialogue was happening one-way, such as when the Science Center told the Panel it was testing the hybrid net, the trading zone began to close. Industry partners viewed the scientists as no longer valuing their expertise or viewing it as necessary. Fishers perceived the Science Center scientists as reasserting scientific privilege and denigrating fishers’ knowledge, exercising institutional power to maintain a boundary between scientific and fishers’ knowledge. The black box that characterized the survey was opened up via the Panel in order to create transparency and improve the legitimacy of the survey (and more generally the science used in policy-making). It is not surprising that reduction in transparency, leading to re-closure of the black box, ended the collaboration. The Science Center’s decision to test an alternative trawl net design lacked transparency due to the way the decision was presented – i.e., the Science Center did not ask the Panel whether they should test the hybrid gear but rather informed them that it was going to be tested. This decision created a space for Panel member speculation about hidden agendas, such as pressure operating outside of the process. These speculations emerged because of the politically sensitive nature of the survey, and the long history of distrust that existed between fishers and scientists in this region. Similarly, decisions about sweeps and doors also lacked transparency; to the Panel, they took place ‘behind closed doors’ and represented the dismissal of their knowledge, including their interactional expertise (i.e., their ability to look at the scientific data and contribute their opinion on the matter). Most importantly, the Panel was recognized by all participants as ‘advisory;’ as such it would ordinarily be considered to lack decision-making authority. Again, context mattered. Industry participants expected greater say, based on what had happened early in the process, but the Science Center ultimately reclaimed exclusive decision-making power over the survey. Scientists see their professional roles as requiring that they do what they can to protect the ‘objectivity’ of their enterprise, particularly something as important as a resource survey, and cannot allow themselves to be seen as fully cooperative with the industry. It is possible that the two groups may have come to the collaboration with somewhat different expectations, the Science Center people working within the advisory framework, wanting to collaborate but assuming all along that the decisions (and the responsibility) were theirs, while at least some of the industry members thought the invitation to collaborate meant sharing in the decision-making as well. In the end, the Science Center made the final decision based on its analysis of the data, believing they had “followed both the advice of the Panel and motions by the Councils.” It is clear that the industry members of the Panel felt that they should have had more say in how their advice was followed. Again, the power differential in this system was reinforced when the scientists unintentionally reduced transparency in the process and returned conditions to the prior “us vs. them” scenario. We find the trading zone framework to be useful to illustrate shifts that occur within collaborative efforts resulting from internal and external conditions – such as emergence of crises/problems, political pressure, institutional change, creation or use of boundary objects, involvement of those with interactional expertise (or the development of interactional expertise if not existing already), and institutional power/boundary work. All of these conditions were seen in the evolution of the Trawl Survey Advisory Panel (Figure 1). Our analysis adds to the trading zone framework an external space to represent ‘no trading zone’ (Figure 1), similar to Jenkins’ (2010) space representing “unfavorable conditions” for the development of trading zones. Given that the state of ‘no trade’ existed in our case for some 40 years, we theorize that trading zones emerge from the initiation of a problem, crisis, or some challenge to the status quo. This is not unlike what has been proposed as explaining the emergence of other institutions (McCay 2002; North 1990). In the shift from ‘no-trade,’ those in power are forced to allow others into the ‘zone,’ and thus, we suggest that the evolution of trading zones is likely to begin with ‘enforced trading zones.’ From our analysis of this case, we expect that how a trading zone develops will be determined largely by the context (severity of the crisis or problem, history of trust among participants, legal mandates, etc.) and structure (participant attributes, levels of transparency and power-sharing, etc.) of the effort. Moreover, the availability of interactional expertise, boundary organizations, and boundary objects can influence the outcome of the collaboration. If collaboration is the goal, our case suggests that making use of boundary objects and selecting individuals with interactional expertise are important ways to shift the effort from an enforced trading zone (coercion) to genuine collaboration. However, our case also suggests that even when individuals have a shared language or interactional expertise, high levels of collaboration are difficult to sustain when there is insufficient transparency occurring, especially in the context of a history of distrust and sharply differential power relations. In these situations, which characterize many industry-science collaborations, those with power should be sensitive to participants’ need for transparency if they wish collaboration to continue. Our findings suggest that a highly collaborative but advisory project, at least in the US fisheries context, carries the seeds of its own demise. There are expectations about full disclosure, power sharing, and integrating fishers’ contributory expertise. Fishers typically chosen for these advisory efforts are selected because their expertise is valuable for decision-making, particularly where science-based knowledge is often scarce or uncertain. It is not surprising that fishers would expect their input to be taken seriously. On the other hand, the legal and political context requires clear boundaries protecting the scientific bases of decision-making. In the end, scientists are forced to reassert their authority, ultimately, at the expense of the collaboration. They are able to do this because the collaboration is advisory. Therefore, meeting these somewhat conflicting expectations inherent in these collaborative, but advisory, efforts may not be sustainable, or, at best, very difficult to achieve. TJ carried out the ethnographic research, data analysis, and drafted the manuscript. BM contributed to the analysis and writing. Both authors read and approved the final manuscript.